Home » audio » How to Convert and Play APE files on Mac and Windows? Monkey's Audio (APE) is a lossless audio file type. Unlike traditional methods such as MP3, OGG, or WMA that permanently discard quality to save space, APE does not discard data during the process of encoding but still saves a lot of space. And you can always decompress your Monkey's Audio files back to the exact, original files. A fly in the ointment is that we often failed to play APE files on our media player (like iTunes, Winamp, WMP etc) or portable devices (like iPod, iPhone, Android etc). Why Failed to Play APE Files? The main reason is that: APE audio file employs a symmetric algorithm, meaning the decoding takes comparable resources to encoding, which makes it unsuitable for all but the fastest portable players (via Rockbox firmware). Another reason is that: it has limited support on software platforms other than Windows; on other platforms only decoding is officially supported by third-party programs. Although the original source code is freely available, the license is not considered to be an open source one. How to Successfully Play APE Audio anywhere? In order to successfully play Monkey's Audio successfully, we had better convert APE to more widely accepted audio format. Luckily, we have Bigasoft Audio Converter (the professional APE Converter) which can easily convert APE to MP3, WAV, M4A, WMA, OGG, AAC, AC3, AUD, AIFF, AU, RA and more. 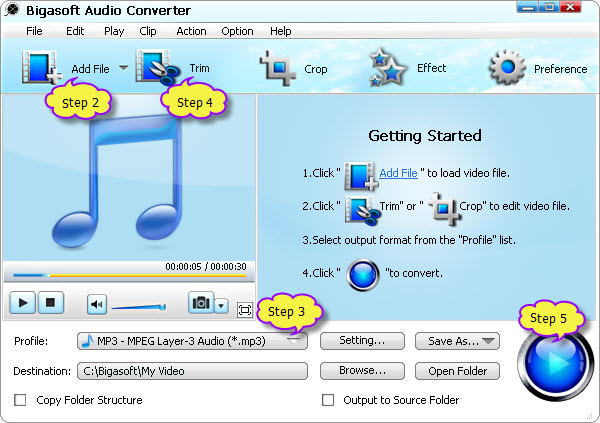 The following will describe a step by step guide on how to convert APE to WAV, MP3, M4A, WMA, AU, RA, OGG, AAC, AC3, and MP2 with this powerful APE Converter. 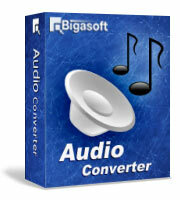 Free download and install the professional APE Converter - Bigasoft Audio Converter (Windows Version, Mac Version), and then run the software. Click the drop-down button on the right side of "Profile" to select desired output audio format like MP3, WAV, WMA, M4A, AAC, OGG, and more from the "General Audio" category. To only convert preferable segment of APE audio: click "Trim" button to set the start time and end time of the desired audio clip. To merge several APE files into one: select the APE files that you want to merge into one file in the task list; then click "Merge Selected into one" in the context menu. To increase the original APE audio volume: click "Setting..." button, the "Advanced Settings" Window will pop up right beside the main window. In the "Advanced Settings" Window, click "Advanced" tab, and then go to "Audio" column, click 100% tab on the right side of volume to select preferable volume ratio from the drop-down list or just enter the desired volume ratio like 300%, 400%. Press "Convert" button start the APE to MP3, APE to WAV, APE to M4A, APE to WMA, APE to AAC or APE to AIFF conversion. It will be finished with high output quality and fast converting speed.